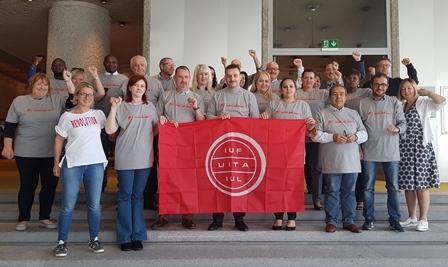 Trade union representatives from 19 unions in 16 countries across the globe met in Geneva on September 27 and 28 to build union strength to defend rights and protect employment at Nestlé. Defending trade union rights, combatting job destruction and stopping the growth of precarious employment were amongst the main issues discussed at the Global Meeting of Nestlé Unions. Nestlé workers and their unions are confronted with increasingly aggressive cost-cutting and restructuring as the company seeks to satisfy the greed of large shareholders and yields to pressure from aggressive predatory investors. The IUF and affiliates pledged solidarity and support to the German Food Workers' Union, NGG, and their members at Nestlé, whose jobs and livelihoods are currently under attack: the company has announced closures, job cuts and attacks on collective agreements in Germany to squeeze out concessions on wages and benefits. The IUF Secretariat was requested to develop a strategy to defend workers against the company's attacks. Participants left the meeting determined to campaign and fight together under the umbrella of the IUF to protect the livelihoods and the future of Nestlé workers everywhere.